This review is about item#6788284. It is convenient because it is easy to cut short and mark → peel off. When you want to close the screw cap of the container tightly, wrap around the mouth of the container and close the screw cap. Close the lid and wrap it with tape. As it is cheap, it can be used in various ways. The quality is good for the price. This review is about item#6788293. I feel a little thin, but no particular problems. I think cheap is good. Finely broken, broken, unstretched due to tape aging It is cheap. This review is about item#6788363. We purchase every time without being cut off on the way It is useful because it can be purchased cheaply. This review is about item#6788241. The texture is a bit rough with no luster. I feel that it is easy to break out, although it is slightly more than the glossy plastic tape that I usually purchase at home centers. There were no problems with fixing the cables in my application, but I think that some people may be worried depending on the usage. This is enough. Cheap is the first death. I will buy it again. This review is about item#6788266. It feels thin and hard compared to general binite. I don't care much in summer, but it is easy to break off often in winter. There is no problem with adhesion. Having said that, I have been using it for a long time. It is good to use, and a white tape is used instead of F.
This vinyl tape was a little hard. I think it is better to be softer. The color of the screw protection and type is divided. It is thin and easy to wind. This review is about item#06788381. This review is about item#6788275. There was no problem with what I used regularly. I can purchase it cheaply, and I have been repeating it many times. Arrival was also early. I am helping wire insulation. I think whether it can be used properly because the color is also various. This review is about item#6788327. I think that the price is inexpensive and it is good for introducing it in large quantities. I do not feel trouble especially when using. This review is about item#06788284. It is used because it is used for electric construction, expendable item, so it is cheap and I can work without fault. There is no problem on quality. 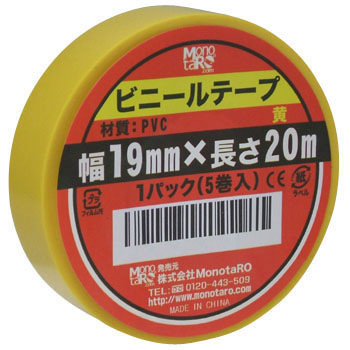 The thickness of the tape is not too thick and the adhesion material with good adhesion does not get sticky. This review is about item#9153252.